In a special post to mark the upcoming National Maintenance Week, guest author Kate Streeter Project Manager of SPAB Maintenance Cooperatives tells us about their plans for launching the week and encouraging ongoing maintenance. A stitch in time saves nine, and nowhere is this more true than for our places of worship, where we estimate that for every £1 not spent on planned preventative maintenance will likely cost £20 in emergency repairs. This is where the Society for the protection of Ancient Buildings (SPAB) Maintenance Co-operative Project steps in. 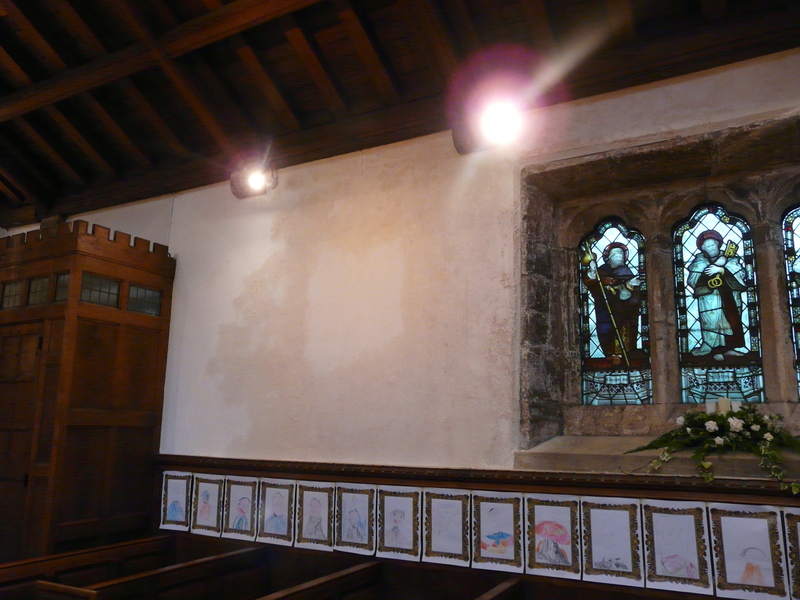 The project team are working hard in four regions (Cumbria, The North East, Lincolnshire, Herefordshire and Worcestershire, and Dorset and Somerset) to bring together places of worship with volunteers who would like to assist with their upkeep, to form Maintenance Co-operatives. Each co-operative is supported by a dedicated SPAB member of staff, offered tailor-made training and access to an array of resources. The training begins by taking participants through the process of carrying out a condition survey and using this information to write an annual maintenance plan. It also covers topics such as working with architects, dealing with damp and when to bring in professional help. A year into the project and we have co-operatives springing up all across the country busily working to ensure the long-term future of their historic buildings. We are delighted that many of the volunteers involved, places of worship, and representatives from our hugely supportive project partners (who include The National Churches Trust, Caring for Gods Acre, Arthur Rank Centre, English Heritage, and major funders the Heritage Lottery Fund) are coming together in York this November for the very first Maintenance Co-operatives conference. This is a wonderful opportunity for those already involved to share ideas, and for those new to the project to find out more. A packed scheduled of speakers from SPAB and our partners will be followed by fascinating York walking tours, the opportunity to put your maintenance concerns directly to our dedicated technical advisor, and of course a sociable drink in the pub to finish the day. We very much hope that you can join us, tickets are free and there are a limited number of travel bursaries of up to £100 available to volunteers, so book soon! Last week I was a morning guest on my local BBC Radio station (Sheffield). It’s a regular slot where 2 people from varying walks of life are brought on to discuss what is happening for them at work, in life and also what’s going on in the news that day. Last week I was paired with a lovely man, Pete, who turned out to be a brewer from Barnsley. To many people we may seem like opposite ends of the spectrum – me working with ‘the church’ and Pete encouraging us all into craziness on a Friday night. But the link between church and beer is long and fascinating. 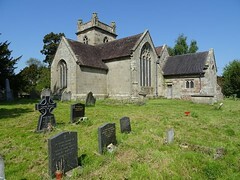 It is also clearly evident in many villages, where the pub stands either opposite or close to the church. In fact, Sheffield is home to the only remaining pub on consecrated land (in the churchyard) – the Cross Kays at St Mary, Handsworth. In Medieval Britain the ‘church ale’ was a regular festival for which ale was brewed by the churchwardens and then sold to raise money for church expenses and relief of the poor. The word ‘ale’ was used for a festival at which the ale was sold, and there would be several through the year, including the leet-ale (held on the manorial court day); the lamb-ale (held at lamb-shearing); and the Whitsun-ale (held at Whitsun). The word bridal originally derives from bride-ale, the wedding feast. With churches now exploring innovative ways of funding repairs as well as encouraging additional use by the local community and visitors, the idea of the ‘church ale’ is undergoing a resurgence. A recent article by the BBC explores the restoration of brewing at Ampleforth Abbey. The Yorkshire-based monks see their current endeavours as following historic practice. They are currently the only British monks brewing beer, but there has been a global trend of Benedictine orders commercially making and selling beers. Abbey Beer was named best drink of 2012 by Deliciously Yorkshire and the profits they are making on the back of their success are invested back into the upkeep of the monastic community. For most parish churches the practicalities of brewing and selling beer are very complicated. However, many churches are finding a way to return to the tradition of the ‘church ale’ and are reaping financial and community benefits. 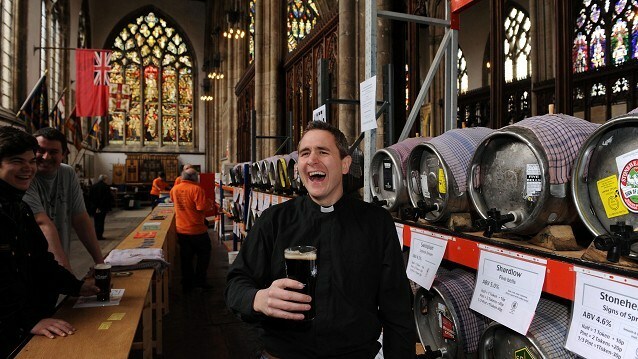 There are a number of annual beer festivals taking place in churches, including the Hull Real Ale and Cider Festival at Holy Trinity, Hull (the largest parish church in England). Last year the event attracted 2000 people over 3 days – which this year starts today! Hull is not alone though… just do a google search for ‘church beer festival’ and a whole host appear! Lets get out and enjoy them, and know that we are also helping to support some amazing and important buildings. 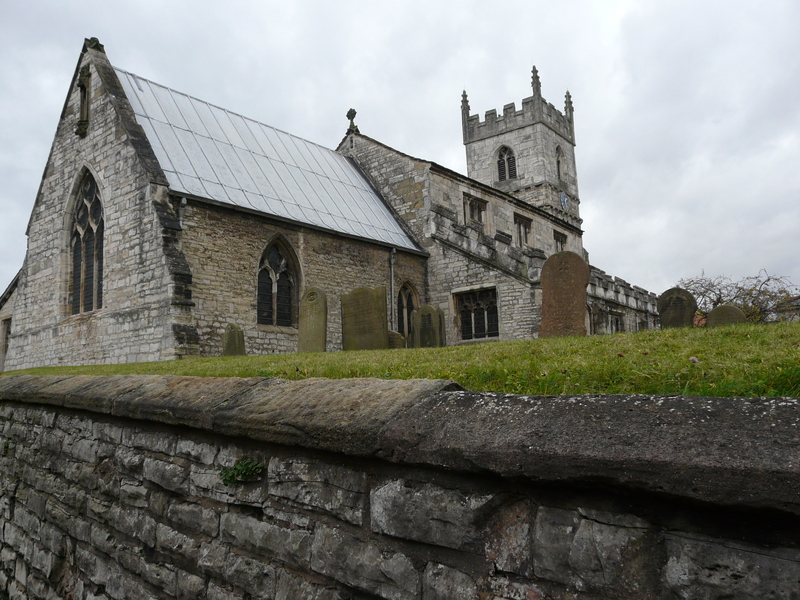 Recently I had the pleasure of visiting the beautiful church of St Wilfrid, Monk Fryston near York. 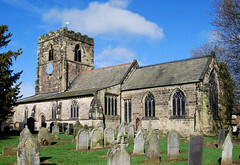 I was there to help assess their application for funding from the National Churches Trust, for repairs to the stone tile roof of the church. However, whilst there I was struck by the warm welcome I was given by everyone there to meet me, and by the obvious community involvement with the church – particularly the close relationship between the church and local children. 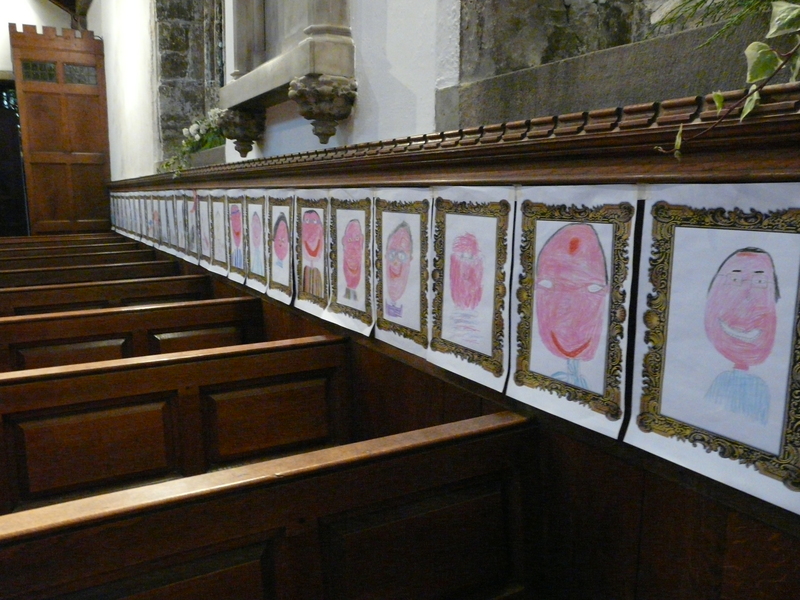 The evidence of their work and involvement with the church is all around the building, quite literally when you realise that around the walls of the nave are drawings and paintings of the Vicar by local schoolchildren. Revd John Hetherington told me ‘The pictures were part of a competition by the Year 1 & Year 2 children to see who could paint the best picture of ‘Me’. It was done in November of this year and there were prizes for the best three and these were presented in school a couple of weeks ago. Many of the kids from school also attend the St Wilfrid’s Sunday Club’. What was especially lovely was the care with which the drawings were displayed… neatly but with pride of place, and adding to the warm welcoming feeling within the building. 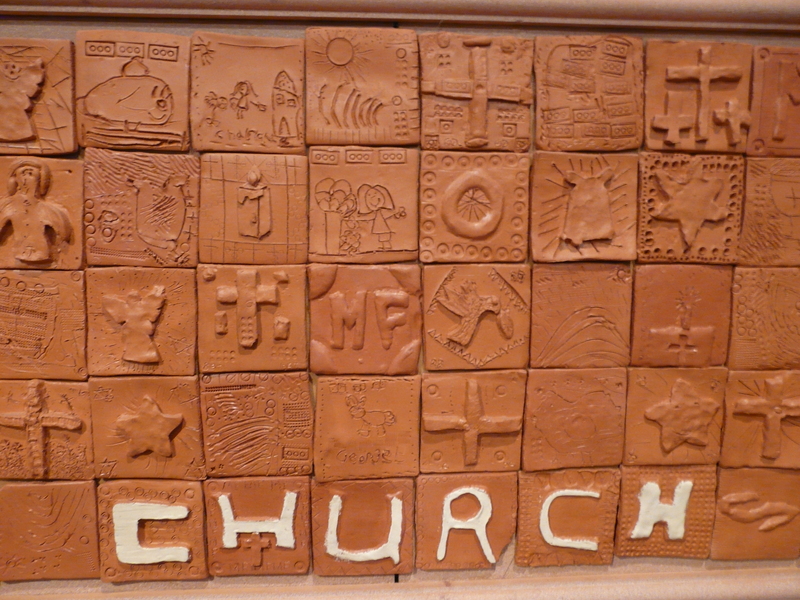 Looking more closely, at the east end of the north aisle is a wonderful ‘reredos’ created from fired clay tiles – each created by a child from the Church School (Monk Fryston Church of England Primary School). They were completed two years ago in the summer of 2010, with each child did an image of what ‘God’ meant to them personally. Once the slides had been kiln-fired they were divided, with half were placed in the church and the other half in the entrance to the school. These projects are brilliant, one permanent and one temporary but both enhancing and confirming the relationship between the church and local children. This is one of the most important things a village church can do. Local children will form the backbone of the community who will one day care for the building, encouraging them to see it as ‘theirs’ is vital. So, if you are ever up near Monk Fryston why not pay a visit to this beautiful and engaging church. There is evidence that there was a pre-conquest church on the site and in all probability Archbishop Thomas re-built the church around 1080. Building work continued into the 15th century and on the 12th May 1444 the then Archbishop issued a commission to John, Bishop of Philippopolis to dedicate and consecrate the parish church and churchyard at Monkfriston. There is documentary proof that would suggest the church was originally dedicated to St Mary. In two 16th century parishoners’ wills they state – William Wheldale in 1547 desired to be buried “in the church yerde of our ladie in Monkfriston” and Ralph Horsman in 1553 “within the churche of oure blessed ladie at Monke Friston”. You can pick up a full history of the church when you visit, as I did. With such a long history, it’s not surprising that the church roof and parts of the tower have now developed more leaks than there are buckets to contain them and essential restoration work needs to be carried out to rectify this. Of course, this does not come without a considerable cost implication, and whilst English Heritage have generously offered a grant of £110,000 towards the repairs, an additional amount of around £50,000 is still needed. 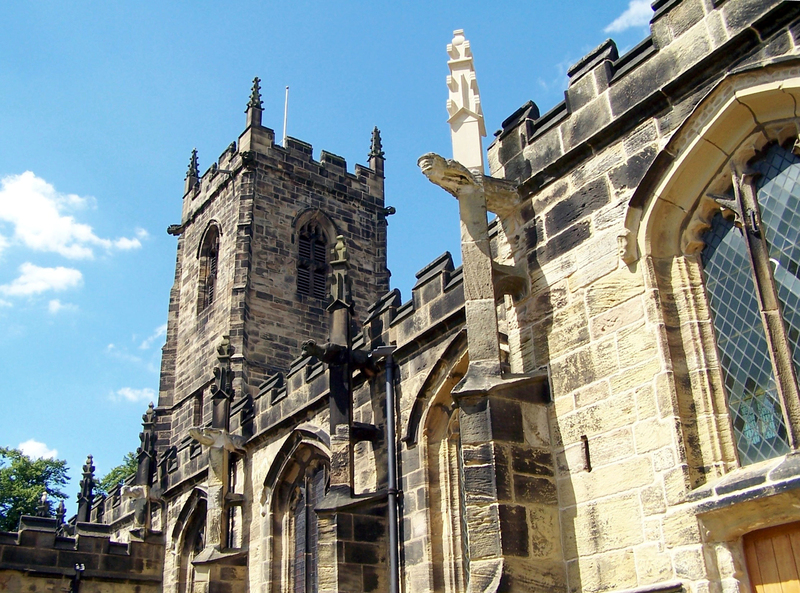 Unfortunately the National Churches Trust was unable to offer St Wilfrid’s a grant as our grant programmes are always greatly oversubscribed for the amount of funding we have available to distribute. 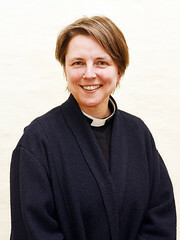 But, the church has established a fundraising and events group ‘Wilfileaks‘. If you can help with their efforts please get in touch with them directly.